Winmate has added a new touch panel to its product family and it’s the 32-inch industrial panel PC with full 1080p display. This product features an enhanced 1920 x 1080 display built into an aluminum enclosure, with a flat front surface, making it a great solution for businesses or industries that would benefit from a larger display and higher screen resolution. The W32IK7T-PCA1 (for panel PC) and W32L100-PCA1 (for display) are fairly sleek, compact and slim compared with most touch panel PC’s and an IP65 sealing of the front panel ensures that it’s totally impervious to dust and resistant to liquid spills. The W32IK7T-PCA1 can be ordered with a Skylake Intel 6th Generation Core i3 (2.7GHz) / i5 (2.3GHz) / i7 (2.4GHz) processors. 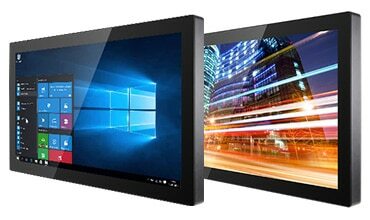 Multi-touch panel PC with projected capacitive (PCAP) touch technology. The W32IK7T-PCA1 industrial panel PC from Winmate carries several on-board interfaces for the easy and flexible integration of whatever peripheral devices an application requires. These include a display port (supports DP 1.2), an HDMI (supports HDMI 1.4), four USB 3.0 ports, two RJ-45 10/100/1000 Mbps, one mic in, and one RS-232 connector. Founded in 1996 in Taipei, Taiwan, Winmate Inc. has become a global manufacturer of touch screens, industrial displays, digital signage, rugged tablets, embedded panel PC, and handheld devices for industries ranging from logistics, transportation, military, and marine to oil and gas, railway, healthcare, medical, smart grid, and field service. In addition to Winmate’s deep range of standard products, the company provides professional services in customizing products and project management. Tactile Technologies is a proud partner of Winmate Inc.
You can discover our full range of Winmate products on the Tactile Technologies website.